In 1831, Samuel Foster and his family built a log house near the rapids of the Kalamazoo River at what is now downtown Otsego. Soon others interested in utilizing the power afforded by the river set up sawmills and grain mills for newly arriving settlers, and the beginnings of a town quickly took shape. In the 1900s, Otsego became synonymous with the paper industry, and for a while, seven paper mills were in operation at the same time. Plainwell, originally called Plainfield and the Junction, situated itself at the crossroads of the old plank roads that led to Grand Rapids, Kalamazoo, and Allegan. Here too, the paper industry played an important part in the growth of Plainwell. Since the downtown area is completely surrounded by the Kalamazoo River and a millrace, it is now referred to as the Island City." Plainwell's historic heritage is evident today through its quaint downtown architecture and beautifully restored neighborhood homes. 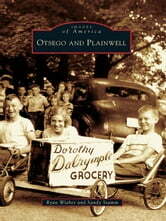 Otsego and Plainwell have grown up close to each other and share their stories, families, and traditions."